This article was recently published in the March 2018 edition of our Spark e-newsletter. The power of print design impacts your daily life too! Welcome to 2018, where smart phones, Apple watches, social media and other technology all make a permanent impact on our lives without us even realizing. It’s true that most days more people spend time looking at pixels rather than paper. In the growing world of technology, it’s easy to imagine that nearly anything can be done digitally. While this technology-driven world is exciting and opens so many possibilities, the world of print is still thriving. Hundreds – maybe even thousands – of ads, websites, and multimedia may scan your smart phone’s screen daily. Remember that magazine on your kitchen counter that you can’t stop scanning every time you go to the fridge or the postcard you keep with coupons to your favorite store? The power of print design impacts your daily life too! The best part about print design is that it works hand in hand with the growing future of technology. The best websites, apps, and social media outlets still use print to reinforce their marketing. Print helps take digital messages even further by delivering an item that can be physically impacting and memorable. It is also often used to drive more traffic to a business’ website or app. At MCS, we go to great lengths to produce functional and exceptional work for our clients. Having been in the business for 28 years, we know the ins and outs of print design and have the best resources to make a client’s vision a reality. 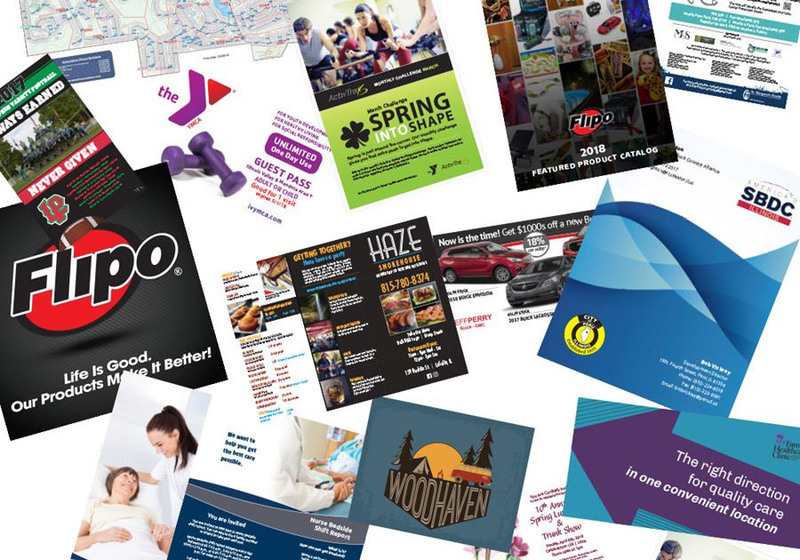 We specialize in all things visual and can help you find the best mix of print and digital products for your business. Earlier this year, MCS opened a second location in Downtown Peru dedicated to printing. This new production facility houses our all new Xerox V180 Digital Printing Press, as well as our Duplo DC 646 Trimming Machine, Duplo DF 1200 Folding Press and guillotine paper cutter. The addition of our new equipment expands our in-house printing capability and production. With high quality stock and a variety of sizing options, the possibilities of printed materials are endless. From postcards with personalized mailings, high quality booklets with full bleeds, envelopes, invitations and rsvp cards, to everything in between. Not to mention, we also still print large format products, such as banners, posters, window clings, adhesive wall graphics and more. Our digital equipment has many advantages, including the high standard image quality, faster turnaround time, output control, and flexibility. With our new equipment and capabilities also came the need to hire our Digital Print Manager, Austin Bowden. Austin’s extensive training on our Xerox printer allows us to serve our clients growing and changing needs in print design. We work to help you get your message out, while helping you reach a larger audience. Set up a consultation today to see how the power and performance of print can increase brand awareness for your business.